First-time incoming freshmen have the opportunity to apply for scholarships at the University of Louisiana at Lafayette. The deadline for submission is January 31, 2006. 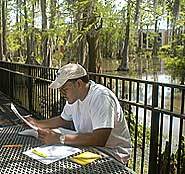 UL Lafayette offers incoming freshmen a host of scholarships that include the Jefferson Caffery Scholarship, the Academic Scholarship, the Centennial Scholarship, the Academic Excellence Scholarship, the Distinguished Freshman Scholarship, the Distinguished Freshman Housing Scholarship and the Centennial Valedictorian Scholarship. A copy of the student's high school transcript and ACT or SAT scores may be included with the application. Applications may be obtained from high school guidance counselors, a UL Lafayette Admissions Counselor or the UL Lafayette Scholarship Office. All information should be returned to the UL Lafayette Scholarship Office by January 31, 2006. For additional information, contact the Scholarship Office at (337) 482-6515. Office hours are from 7:30 a.m. to 5 p.m. Monday through Thursday and 7:30 a.m. until 12:30 p.m. on Fridays.